The latest Oral-B UK’s TV ad stars a young woman talking about her experience with Oral-B Pro-Expert. “When I went pro with Oral-B Pro-Expert toothpaste I thought: Wow! My teeth did feel way cleaner. Must something to do with the probe. And when I discovered Oral-B Mouthwash I thought… Wow! Great taste, no burn and my whole mouth just feels… you know, healthier”. The voice over says “For a healthy mouth starting from day one. 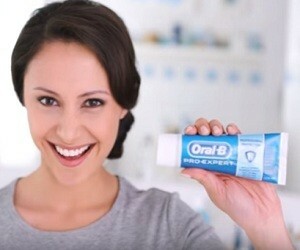 Go Pro with Oral-B Pro-Expert”.